While Thanksgiving it’s not an actual holiday here in Sweden I am celebrating in my own way. The sun is out (wow! ), the ocean + sunrise was a sight for soar, sleep deprived eyes and I dusted off my gratitude journal last night (wow again) and wrote down a couple of ahhh-incredible things that I’m truly grateful for. A total upgrade from spending the night answering emails, working or just dosing off. By the way, all credit goes to that gleaming full moon which we all know I am totally bewitched by. Anyway, I felt like sharing with you two things that came up (more things and this text would be one case of oversharing/bore to read). YOU. Over and over during these last few years of writing and creating in this space I’m blown away (seriously) by the love and truly life-altering things that come up when connecting weather it’s in email, the comments below a post or on social media. There is nothing more special then seeing how we are all really just co-creating, intertwined in our urge to be, do good and have fun! This grand web is a major playground for goodness if we let it be. I just wish we could all meet up for the biggest potluck/hug-party/dance-fest ever. Soon?! 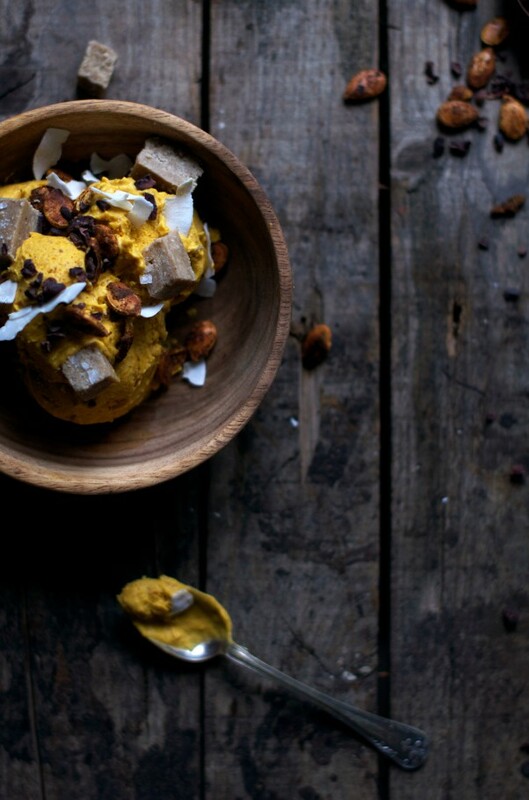 I know I’d wonder what to make and then I’d end up bringing this Pumpkin & Spice Ice Cream (you would so not be disappointed). Another thing I wrote down was when two weeks back, Fabian helped me outline a badass schedule that stretches well into January. He saw (and noticed from my crazy-ness) that my head was a mess from trying to figure out all.the.things. So one night he went and saved my life (or sanity). Just like that. Now when I have work-time I slap on my wristwatch, put my phone away, look at that schedule he scribbled down and I get things done. And get this: I still have time to do me-things. High fives all around! I actually used to take pride in not having to have a minutely structured schedule and instead being all flow-y and stuff. It has been right in periods but life keeps getting fuller and Fabian made me realize that at this time, some added structure was a change I needed in my life. And guess what? Daniel Wellington noted that me and Fabian have a thing for their gorgeous Swedish(!) watches and asked if I thought it would be rad if they offered you guys a sweet holiday treat. Um, yes. I’m down with that. So, if you feel like gifting yourself or someone you love a really neat watch, use the code ’EARTHSPROUT’ here to get 15% off the original price (1/12-16/1) ..and give yourself a break from constantly needing to check the time on your phone (we all know where it leads ;). – Do It Yourself-ify the pumpkin craze! Canned pumpkin, pumpkin spice, pumpkin chocolate bars, pumpkin latte & pumpkin bread-mixes. Pumpkin really is everywhere during this season, and for a good reason! It’s an easy crop to grow, it’s incredibly tasty and it is -in it’s natural state- ridiculously healthy. It’s just that.. well, what other things are in those store-bought, convenience ’foods’. It does not take the biggest brain to figure out that the list of ingredients is longer then one might want. Milk powders, sugar in every processed form available, preservatives, artificial dyes. I’m left dumbfounded. Does all the gorgeousness that is a pumpkin need that added stuff? No! Sure, there might be some clean canned pumpkin brands out there but do you guys know how ridiculously easy it is to make your own pumpkin- puree & spice? Plus, another bonus is the level of nutrients in the final product. The one you make at home will be very fresh and thus have as many of those much wanted nutrients intact. Win-win. So even though it’s really easy, I though I’d share how to make your own pumpkin puree and pumpkin spice! Real Deal Pumpkin Puree Turn on an oven (175°C / 350°F), slice open a sweet pumpkin (hokkaido, butternut squash, sugar pumpkin) and cut in 4-8 pieces. Remove seeds and bake for 30-ish minutes (depending on variety & size). Only remove the skin if the pumpkin isn’t organic or if the skin is really hard. If so, do that now. 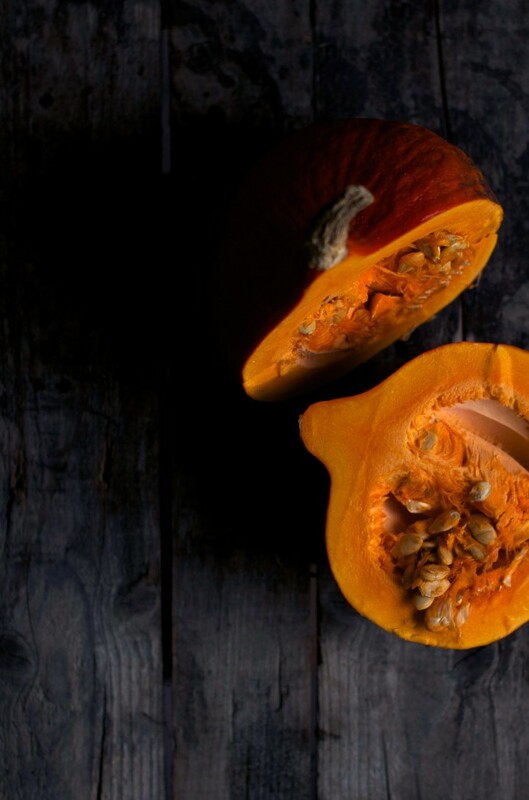 Mix pumpkin until smooth with an immersion blender, food processor or high speed blender. Done! Ps. see that silky smooth freshly made puree below? Who would not want to dive into that?! Real Deal Pumpkin Spice Get yourself some cinnamon, cardamom, cloves and all spice, grind in a coffee grinder (or even buy pre-ground). I usually go for about 2 tbsp each of cinnamon and cardamom, 1/2-1 tsp each of all-spice and cloves. I like to add a little ground ginger and nutmeg too. Play with the measurements until you are satisfied, mix and – Ta-daa! 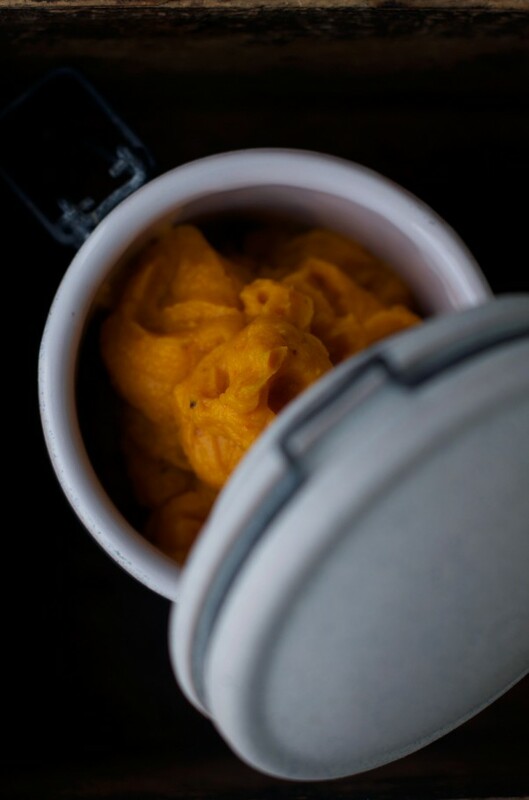 You can easily store the pumpkin puree for a long time by filling sterilized glass jars with warm (important) puree almost up to the top (leave 1 cm/0.4 inches free) put the lid on and flip upside-down. This will create a vacuum that’ll make the puree last for months when stored in a cool, dark place. All without preservatives! OR fill up small bags with the puree, flatten, pile and freeze. No vacuum is obviously required to store your pumpkin spice mix. Just pop the spice mix into a clean dark glass jar and keep it in the fridge where it’ll stay fresh longer. Conclusion: pumpkins rock and next year I am definitely growing far more of them. 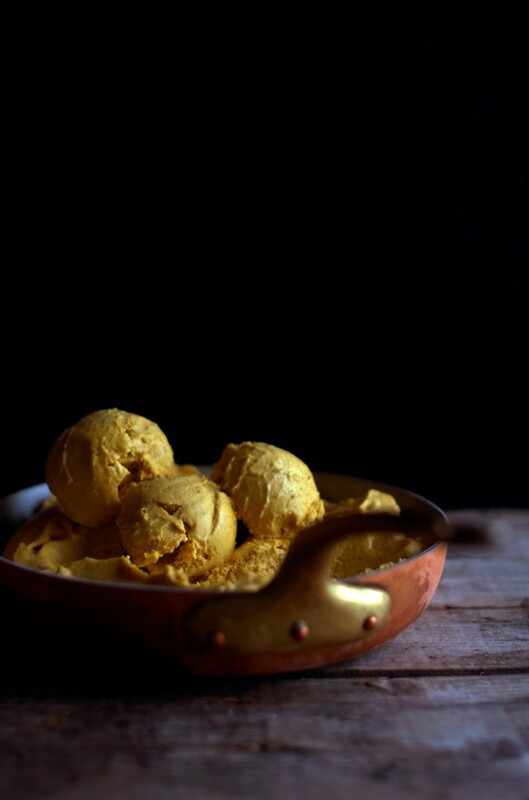 This years harvest is already gone although I have to say that they were put to good use by being the star of some epic meals (& this ice cream). Grab the cans of coconut milk from the fridge, open them up and carefully scoop out the solid layer of coconut cream and add to a food processor. Add 1/2 cup of the coconut water to the food processor as well and save the rest of the coconut water for smoothies or soups. Add the pitted dates, spices, pumpkin puree, lemon juice and lime juice to the food processor. Blend until smooth. Either use an ice cream machine for that extra fluffy creaminess and then freeze or skip the ice cream machine and pop the batter right into the freezer. Freeze for around 1-3 hours depending on if you used an ice cream machine or not. 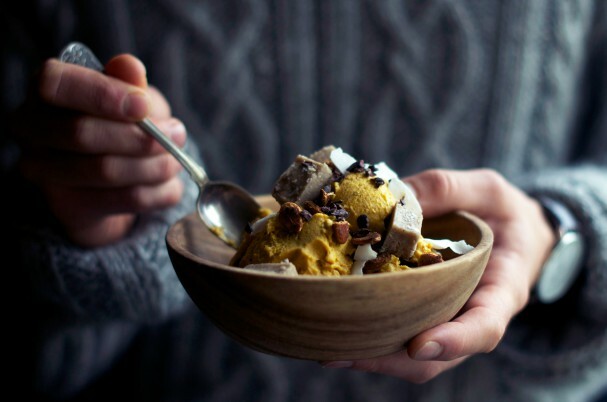 If you make this ice cream ahead of time, allow it to sit in room temperature for 15 minutes prior to scooping up and serving. 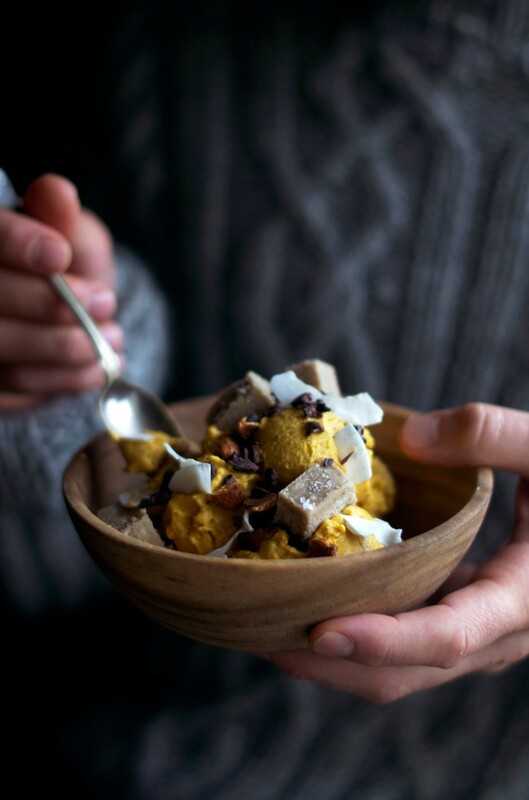 Serve with some spiced pumpkin seeds, cacao nibs and coconut flakes. I went all the way and topped ours with my Tahinioffee too (recipe to come in December!). While making your own pumpkin puree, save the seeds and use 1/3 cup of them to make these crunchy bites! Combine 1/3 cup of seeds with 1 tsp coconut oil, 1 tsp cinnamon & 1/4 tsp cardamom. If you wish add a dash of maple syrup/coconut sugar/other natural sweetener too but in my opinion it’s not really necessary. Add to frying pan and roast on low temperature until dry and crispy, about 15 minutes. I suppose this is the official start of the Holiday season. It sure feels like it to me and I hope that wherever you are in this crazy world, that you feel my love and appreciation for being here and for being all that you are. See you on Instagram, friend! ..and remember the #earthsprout-hashtag if you play around with this ice cream – I can’t wait to see your creations!